Established in 1946 by Alex A. Kozlowski, our company has grown to a full service insurance agency. 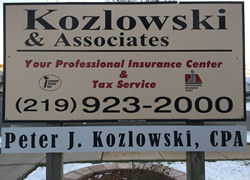 Currently, Kozlowski & Associates serves the insurance needs of about 2,000 individuals and families, and the insurance needs of 150 business concerns in the area. We are independently owned and locally operated to handle your insurance needs. We focus on and offer affordable and reliable insurance choices all across Indiana, Illinois, Wisconsin, Michigan and Minnesota. We invite you to complete an online quote, call us at 219-923-2000, or contact us at info [at] kozlowskiins [dot] com to review coverage options for car insurance, home insurance, life insurance, business insurance, renters insurance, boat insurance, and more. We provide free, no hassle and no obligation insurance quotes to help you make an informed insurance decision. In addition to insurance services, our agency also provides preparation of Individual income tax returns. Our firm is an IRS Authorized E-File Provider. For your business & estate tax needs and planning, please contact our associate Peter J Kozlowski CPA LLC. Kozlowski & Associates strives to offer you quality insurance coverage, a high level of professional service and a long-term relationship. As independent insurance agents in Indiana, we’ll research rates and coverage from top insurance companies to find the best insurance rates and insurance plans for you. We do the insurance shopping and comparing for you to save you time and money!